Dr. Assia Stepanian began her study of MRKH and other mullerian anomalies in 1992. Her mother, Dr. Leila Adamyan, had recently performed the first laparoscopic/ laparovaginal formation of the neovagina using pelvic peritoneum and was invited to publish her work in a book by Professor David Nichols – “Gynecologic and Obstetric Surgery” – in a chapter entitled, “Additional International Perspectives.” Co-authored by Dr. Stepanian, Professor Leila Adamyan’s classification of Mullerian Anomalies is based on the experience of treating over 2,500 patients. Over 350 of those patients had pure MRKH syndrome, and over 600 had various forms of vaginal agenesis including MRKH. See classifications. Upon completion of medical school, Dr. Stepanian was invited to witness the developments in MIGS (Minimally Invasive Gynecologic Surgery) in Russia and around the world. She was fascinated by the capabilities of MIGS in allowing for gentle handling of the tissue, reduction of tissue trauma, and enhancement of the precision of surgical intervention. Her special fascination was with the lining of the pelvic cavity, called peritoneum, (used for the formation of vaginal walls in patients with MRKH and vaginal agenesis) and with its ability to reform into normal vaginal epithelium. 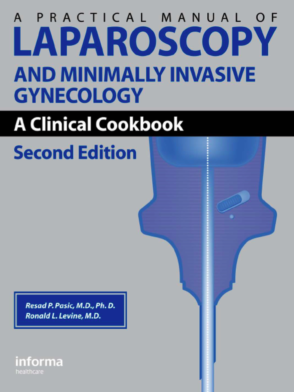 While she offers non-surgical approaches and non-organ involving surgery for creation of the neovagina in patients with vaginal agenesis, patients often choose laparoscopic peritoneal colpopoesis (also called laparoscopic Davidov) because of its ease and minimal invasivity. The benefits of this technique have been observed for nearly 30 years. From medical school to her residency to her honorary professorship at the V.I. Kulakov Scientific Center for Obstetrics, Gynecology, and Perinatology to her practice at Academia of Women’s Health and Endoscopic Surgery, Dr. Stepanian has been involved in research and practice related to treatment of young women with various anomalies. She is able to approach patients holistically and to highly individualize their care based on each patient’s goals. At the first visit, Dr. Stepanian collects detailed information on patient’s history and symptoms and discusses immediate and long-term goals. 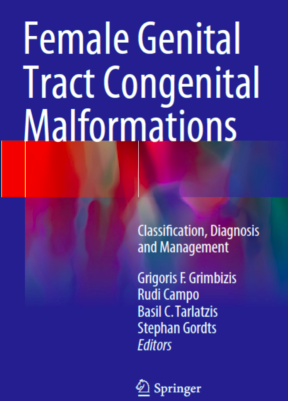 This is a very involved discussion because malformations are often diagnosed in special adolescent years or as a result of miscarriages or infertility. Probably the most important goal of this first visit is the establishment of full understanding of what concerns a patient the most in relation to her malformation. 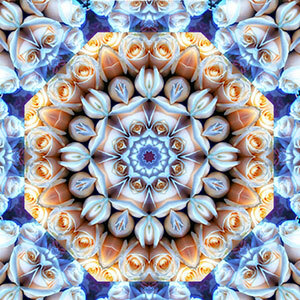 We then identify her current life goals and interests and look into potential long-terms goals in reproduction and intimacy. Such differentiation between type of goals is important. For example, a 15 year old girl with MRKH is not interested in reproductive function at the time of her evaluation with us and is not interested in sexual experience and wants to concentrate on her “normal adolescent experiences.” For such girls, therefore, immediate surgery will not be of benefit. Additionally, she will be unlikely to conduct maintenance of neovagina. On the other hand, someone who may have one of the forms of obstructing anomalies with associated pain needs to be treated much sooner, conservatively or surgically, with a long-term strategy created. Associated anomalies are seen in 74% of patients with mullerian anomalies and require entire evaluation. Lack of attention to these anomalies may cause lack of knowledge of individual nuances when conducting anesthesia and lack of consideration for medical and surgical risks of these particular patients. 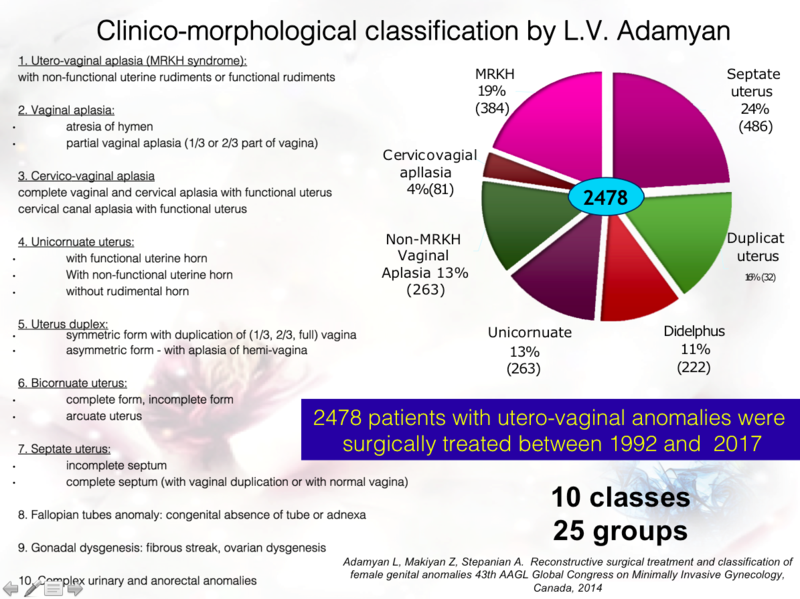 Associated other gynecological conditions, of which the most prevalent is endometriosis, are seen in over 40% of patients with anomalies, and in over 80% of patients with obstructive anomalies. Knowledge of endometriosis patterns of progression and methods of management in patients with malformations is of a great benefit to the patients.Since 2005, Dr. Stepanian has often been invited to speak and chair at different international conferences with auditoriums ranging from 50 people to over 2,000. She teaches doctors as well as patients and is a constant referral source for physicians, organizations, and insurance companies in the US. Her wealth of experience makes her uniquely qualified to treat all forms of mullerian anomalies, including complex ones and the ones in which previous surgery or interventions did not reach adequate effect. Dr. Assia Stepanian is honored to bring her mother’s techniques to the United States and to add her own experience in treating patients. She sees her U.S. patients at her practice, Academia of Women’s Health and Endoscopic Surgery in Atlanta, Georgia. “I am writing this letter in efforts to express my gratitude for Dr. Assia Stepanian (Dr. S.) and her clinic staff.